Buying Pieces and Elements for MOC's & Tips for Displaying at LEGO Conventions? Now for your help! I need to know what is the best way to purchase parts for LEGO MOC's, I plan to display some of my best creations that you guys have already seen as well as some new secret projects. What is the best option or cheapest way to build LEGO MOC's? Pick-A-Brick, buying multiple sets, Bricklink/Brickowl etc. How do you guys plan in advance? 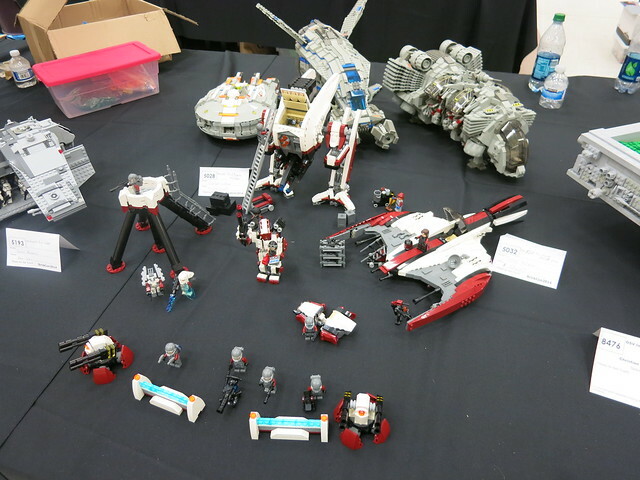 Any other tips and ideas you guys have to help me with your past experiences of LEGO conventions and building MOC's? Check what is available at PAB, then head to bricklink. Maybe modify a design if some parts are expensive and you can make do with cheaper or more available parts, especially if you need a large quantity. I think it is generally agreed that cheapest way to buy bricks is sets and lots. Lots are cheaper but you take a chance at what is in there. Sets you can plan on what you need, and if you have time part and sell minifigs to make the bricks even cheaper. Bottom line either sets or lots will beat PAB/bricklink/brickowl prices. However it will also take more time to get the bricks you want this way, which is why if you MOC for competition for example you would normally use bricklink and similar - more expensive, but way quicker. Buying sets or (unknown) lots means you are spending lots of money on presumably unwanted parts. And if you need a lot of a part, you may end up buying many many copies of a set to get enough since usually most sets don't have huge quantities of single parts. Yes of course, but the point still stands - it will be cheaper than buying specific bits on bricklink and similar. If you MOC, like to MOC and plan to MOC in the future, there won't be many "unwanted" parts (even the most "unwanted" bits are routinely get used in foundations, people even use Duplo there!). Worst case scenario you can always put the stuff you don't need back into lot and sell it, making your other bricks even cheaper. All it takes is time. This is the only aspect where buying sets/lots is at disadvantage over specific bits on bricklink. But the OP asked about planning in advance, which is the wisest way to go about it, and with this in mind you aim at building your collection over time, not in the last minute when you have to produce a MOC. If you go the Bricklink route, it's best to buy as much as you can from as few sellers as possible. That may seem obvious, but I feel it's still important to stress. It really helps to make want lists and stick to sellers with the most in stock first. Even if you pay a little bit more for a part here and there, the time and money saved on postage is well worth it. One of my LUGmates often plans what he will use in builds based on what's available in the local PaB wall at the time. It's kind of random, but it works for him. I live too far from the closest LEGO store to let that really be a consideration though. Outside of parts drafts with my LUG, I seldom buy sets just to part-out on my own. That said, I did initially build up some of my collection by buying newly released licensed sets with good parts, then selling off the figs. Even after fees, I usually ended up with the bricks for under 10% of the cost of the set. I build all of my MOCs on LDD, and I've had a little bit of experience buying parts for them. The way I've always done it is to only buy the parts I need. I don't like buying sets for parts. I think part of the reason is because, building on LDD, it's easier to just use any random piece, rather than what you actually have physically. I like the freedom of using any piece I want. Someone more creative than I would probably be able to churn out awesome MOCs using a very limited range of pieces. I would end up with a lot of unused pieces and wasted money if I parted out sets for my LDD MOCs. LDD manager is great because it can convert an LDD model into a BL wanted list, and it can tell you whether a part exists or not. It isn't perfect though. It sometimes misses newer parts, rare parts, or "decorated" parts, so you might have to add those to the wanted list manually. I always go through the wanted list and cross reference with the LDD file to double check and make sure everything gets transferred over. The easiest way to do that is to use the "color & shape" selection tool and just (temporarily) delete pieces from your LDD file as you go through the wanted list. If there is anything left, then the program missed them, and you add them manually. Once I have the wanted list for the parts I need, I just go through and see which stores sell the quantity I need for the cheapest, and try to order from as few stores as possible. I always quadruple check everything to make sure that I'm not missing anything from the LDD file. There is a program out there called brickficiency that figures out the best BL stores to buy from, but I have had issues with the program, so I just find the stores manually. I used to buy parts from PAB a few years ago, but I've found BL to be cheaper (plus PAB has a limited variety of parts). I have no clue what Brickowl is like, but I will probably try it out sooner or later. I think for next year, I will make a few UCS style display plaques to go with some of my bigger movie based MOCs. I do in store PAB every time I visit a LEGO store and come out way ahead. The inventory is constantly rotated so there's a very wide range of what you can pick up. Sure, most of the parts they offer are pretty cheap but you can also find some of the more expensive Technic pieces and joints like 6045718. If you're needing parts that are 3x or smaller, you can get upwards of 800 parts in a small bowl. If you need larger parts then use the large container and fill 're up! That way, you get only the EXACT parts you need with no filler! Unless you're wanting to build your MOCs "right now!" this is definitely the way to go i.m.o. Have a *very* serious think about how you're going to present your models to the public. A bunch of models lined up on a tablecloth with some labels is fine, but you might want to 'jazz' it up a little if you want to get the public's attention. Maybe add a bit of landscaping, or a hangar, or something else to place your models within. Start small-ish with your first show. Think about how you're going to get the models to/from the venue, and how long setup/breakdown is going to take. If you design your display from the outset to be easy to assemble/disassemble & to be able to be packed up into a couple of mid-sized 'Really Useful Boxes' that can easily be carried in the boot of a car, then it'll make your life a lot less difficult on the day. Having as few boxes to shift into/out of the venue will speed things up, especially if you're on your own. If the boxes are too big/heavy to carry easily by hand think about getting a folding trolly, but one that's large enough to carry the boxes without fear of them falling off (and get some bungee cords to give the boxes a bit more stability). If it takes a bit of effort to put your display together, try to practice it at home a few time before the day of the show. Label any personal stuff that you plan to leave on site during the show (e.g. boxes, trolly, bungee cords, etc.). Kids, and the public in general, are attracted to motion & lights; I think that's one of the reasons that train & monorail displays are always popular with visitors. Think about how you might give your models an extra something. If you're building something specific to the show (rather than showing existing models) think about building something that's related to something 'of the moment' - a film, TV series, high profile book, important public anniversary, etc. - that way you're sure to get some extra attention. It goes without saying, but avoid controversial topics. If you're using some interesting building techniques, maybe consider having some pics of the build whilst it was in-progress to hand in case anyone is interested; maybe keep some example test-build prototypes handy. If the model is based on a interesting real-word thing then keep some reference pics close. This will be useful when talking to fellow exhibitors as well as the public. The most important advice though is to relax and have a good time, interacting with the public & your fellow exhibitors. What is the best option or cheapest way to build LEGO MOC's? Pick-A-Brick, buying multiple sets, Bricklink/Brickowl etc. How do you guys plan in advance? (e) trading/buying within a LUG - another advantage of being part of LUG is trading with other members, especially if you need something at short notice. My LUG doesn't do it, but I know a few of the US/Can LUGs have regular 'parts drafts', where they chuck some money together, buy a bunch of sets at discount (e.g. Argos 3-for-2), part them out & divide up the 'spoils'. There's bound to be others I've forgotten. Personally, I use a combination of the above (including approaches mentioned by others) depending on the situation; there isn't a 'one size fits all' solution. 'Bricks and Pieces' is great for getting new parts in bulk, Bricklink is great for getting specific parts when you need them, buying sets at retail is good when you need something quick, LUGbulk is good for basic brick & plate in quantity when it isn't urgent, etc. One big problem I've come across is budget. I have acsses to just over £1100 from now until October. Should I spent all of it on creating MOC's for Brick2015 or should I mix it up and buy a few sets? Is it worth taking apart sets for specific parts, I own many LEGO Super Heroes sets as well as LEGO Ideas and D2C sets? I've been to Brick last year and saw many large layouts. What is the best size to build at? I would like to build some of my best MOC's I have already shown on Flickr. Any tips for smaller builds in similar sizes to offical LEGO sets? I'm currently thinking of doing a large layout as the center piece to attract attention and have smaller builds on the side. What do you think?